Bringing rice and bacon, an omelet with Vietnamese flavour in the final round of the MasterChef US, has won blind girl Christine Ha the championship. 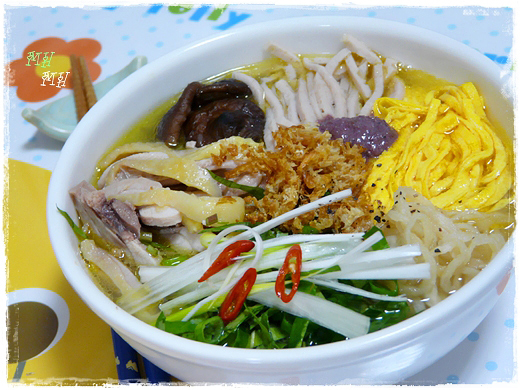 Vietnamese cuisines also set many records in 2012. In September 2012, Christine Ha – of Vietnamese-origin, 33-year-old blind girl from the University of Houston won the top spot of the MasterChef US, third season. Ha defeated 24-year-old chef Josh Marks to win the final prize worth $250,000 in cash, a cookbook publishing contract and the MasterChef trophy. In the finale, Christine Ha and Josh Marks had to prepare three dishes in two hours. Josh Marks chose lobster poached in butter, lamb with sauce of curry and vegetable and bacon pecan cake. Christine Ha made Thai papaya crab salad, rice with bacon, omelet with Vietnamese flavor and ginger and coconut cream. The meal was described by Christine Ha as "a symphony of flavors." They are simply but made the jury was surprised. Many Vietnamese dishes were also introduced by Ha at the MasterChef. On August 20, in Faridabad, Indian, the Asian Organization Record recognized 10 Vietnamese dishes as the Asian records based on the criteria for Asian Cuisine Value. Among them, Hanoi contributed three famous dishes - pho, bun thang and bun cha. HCM City had broken rice and goi cuon. The remaining dishes consist of Haiphong’s crab pancake; Ninh Binh’s rice crust; Nghe An’s eel vermicelli; Hue’s beef vermicelli; Quang Nam’s noodles; Gia Lai’s dried noodle; and Vung Tau’s khot cake. In September, in the "First journey to search Vietnam’s specialties 2012" held by the Vietnam Record Book Center, 50 dishes of various regions in the country were listed as the popular specialties of Vietnam. Hanoi contributes six cuisines to this list, Thua Thien - Hue 5, Ho Chi Minh City 3, Quang Nam 2, Quang Ngai 2, Ca Mau 2, etc. In the top 10 cities in the world with the most attractive street food, selected by the Vancouversun (Canada) in August 2012, Ho Chi Minh City ranked sixth. Asia also contributed 3 other representatives -Penang (Malaysia), Bangkok (Thailand) and Singapore. According to this newspaper, the art of cooking of the Vietnamese goes into the memories of many western tourists, especially street food. Just a short tour around the Ben Thanh market to Binh Tay Market, visitors are able to find the answer why people are fascinated by street food here so much. Street food in Saigon is a mixture of many different culinary cultures, especially the French taste based on the traditional flavors and ingredients of the Vietnamese. 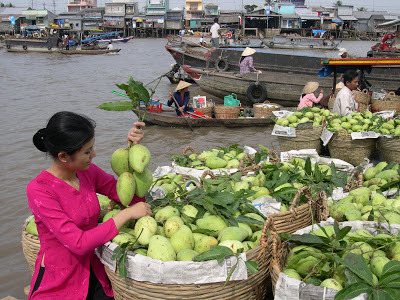 In the "First search of Vietnamese specialties" in August 2012, the Vietnam Record Book Center listed the top 10 delicious fruits of the country. These fruits are granted the "Certificate of trademark registration" by the Intellectual Property Office. These fruits are very familiar and famous: Lo Ren star apple (Tien Giang province); Thanh Ha litchi (Hai Duong); Vung Tau’s litchi with yellow flesh; Ben Tre’s green skin grapefruit; Binh Thuan’s papaya; Hung Yen’s longan. The criteria for selection of the best fruit are not only delicious, but also meet the standard for export.